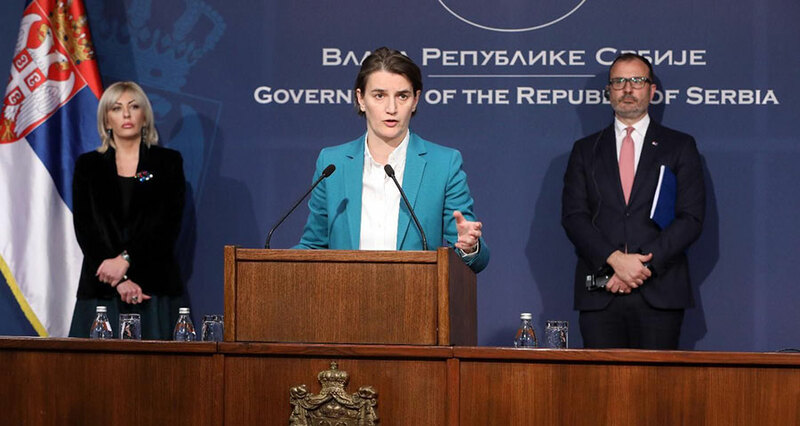 Following the adoption of EU’s Strategy for the Western Balkans, Serbian Prime Minister Ana Brnabic thanked EU Member States for their wholehearted support for Serbia’s EU path. “Only now do we have a timeframe and I believe we should be happy and proud because the EU has recognised the progress Serbia and its citizens have made on the EU path. But most of all, I would like to stress that this is an opportunity, not a guarantee, that we will become a member by 2025,” Ana Brnabic said. “Each day of the coming period and in each segment of the society we should do our best and prove that we deserve to become a member, capable of contributing to the EU and making it stronger,” she said. Brnabic said that the document foresaw EU’s stronger presence in the region and set out six initiatives aimed at strengthening cooperation in key areas: the rule of law, security and migration, socio-economic development, enhancing infrastructural connectivity, digital agenda and support for reconciliation and good neighbourly relations. “The recognition of individual results in meeting the criteria is an important message. We are seen as the leader of the process. From now on, speed and quality will be of key importance, but for Serbia, quality has priority over everything else – we will not be seeking shortcuts on the EU path; we are about the essence of reforms and their proper implementation,” Brnabic said. Prime Minister said that Serbia has proven its commitment to regional stability in the Western Balkans and beyond. “We are aware of our obligations and we are familiar with those that require more effort. We will continue to meet the criteria at greater speed and with more efficiency, for the sake of all of us,” Prime Minister noted. Maintaining a status quo regarding Kosovo and Metohija and leaving it to future generations would be the easiest thing to do, she said, adding that Belgrade wants to resolve the issue now. She said that Serbian President Vucic has initiated a comprehensive agreement on normalisation of relations with Kosovo through an internal dialogue, regardless of European integration. Minister of European Integration Jadranka Joksimovic said that the Strategy set no deadline regarding the reaching of such an agreement. “The contents of the future agreement are by automaticity interpreted as recognition of Kosovo. Serbia will not recognise Kosovo, and the content of such an agreement should be a result of the Belgrade-Pristina dialogue,” the Minister said noting that Belgrade is striving toward a sustainable solution. “We will remain committed to the process. I would like to congratulate the Government of Serbia for understanding how the Strategy works. For the EU, enlargement discussion is a discussion about our own future. We have to work together, it is our common future. The Strategy establishes a fact that we are growing closer each day. This document sets out our common, clear and real future. We are working hand in hand, trying to make our voice heard. We want to shake hands and work toward our future in concert,” Fabrizi said. He said that the European Commission was doing its part of the job to put the enlargement back into focus, adding that he was glad a series of initiatives have been launched to add more quality and speed to the process. “2025 means we have to take an ambitious approach to our goals, quality and speed included. The talks have their own framework, certain chapters have been opened, and normalisation of relations with Pristina is an important topic. The Strategy conveys a clear message that Serbia should not leave a single issue unresolved prior to accession. Serbia and the EU are working round the clock to attain those goals,” Fabrizi said. Fabrizi noted that Serbia has received a simple message – if it wants to become a member and implement the adopted reforms, it has, among other things, to establish the rule of law, independent judiciary and media freedom. “Efficient and meaningful normalisation of relations with Pristina is one of the major topics,” he said and added that Serbia should resolve all outstanding issues before it joins the EU.